As a property manager, you have a lot of different responsibilities on your plate at any given moment. You’re in charge of everything from filling vacant properties to maintaining properties so that they always look their best. With that in mind, the garbage that your tenants create might be one of the least of your concerns. But you should know that valet trash service can actually benefit both you and your tenants in a big way. When you sign up for valet trash service, a company will come directly to your tenants’ doors to collect trash. This will eliminate the need for the big, bulky dumpsters that you have scattered all over the place now. And that’s far from the only benefit that comes along with valet trash collection. Check out some of the other reasons why property managers need to invest in valet trash service below. If your current waste management system requires your tenants to take their garbage all the way out to a dumpster located in the parking lot, this is probably very inconvenient for them. Some tenants might live close to the dumpsters that you have set up. But others might have to walk a far distance every time they want to throw something out. It’s not exactly the most convenient system. When you start scheduling valet trash service, tenants won’t have to make the long trek out to the dumpster anymore. They can simply leave their garbage outside for collection and have it picked up. This will make life so much easier on your tenants. They’ll be happy with you for arranging to have trash picked up right from their front door. As a property manager, one of your goals should be to generate as much income as you can every month. You won’t have any trouble finding work when you’re able to do this for the owners of properties. Once you start using valet trash service, you’ll be able to bring in more money every month by charging higher rents to your tenants. They’ll happily pay for the convenience that comes with having their trash picked up for them. You might get some pushback from your tenants in the beginning. But over time, a company like Address Our Mess will show them the value of valet trash collection. Before long, they won’t be able to imagine their lives without it. Your current tenants will start to willingly pay to have their trash collected. You also won’t have trouble finding new tenants when you offer such a great trash collection service. When it’s cold outside, there are a lot of people who don’t want to run out to the dumpster to throw out a bag of trash. At the same time, they don’t want to keep that bag of trash inside their rental property until the following day. So, what do they usually do? You guessed it! They put the trash outside of their rental unit until they can get around to throwing it out. This can be problematic for a few reasons. 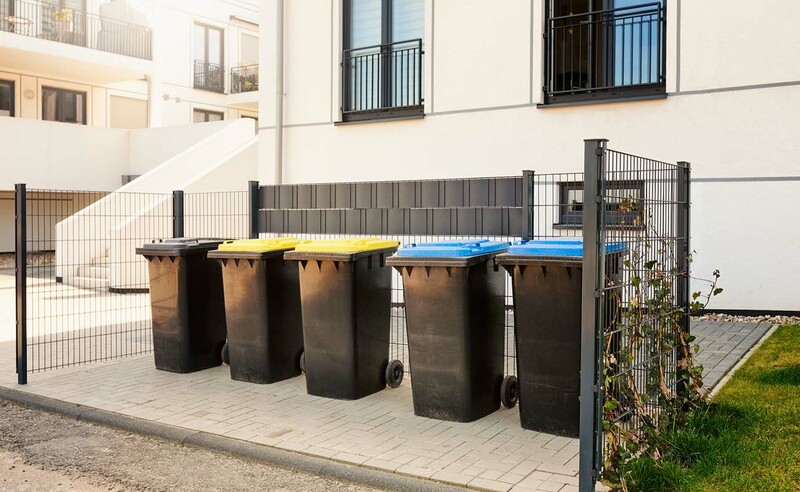 For one, there’s a chance they might not get around to taking the trash out anytime soon, which could lead to trash piling up outside your rental properties. And secondly, trash bags that are left outside could bring rodents and pests up to your building. You could find yourself in a world of trouble as a property manager if people start leaving trash bags all over the place outside. Have you ever stood next to one of your dumpsters on a hot summer day? If so, you know how smelly it can get when it sits and bakes in the sun. And the slightest breeze can take that smell and send it right in the direction of your rental units. You can eliminate the foul odors that often come out of dumpsters by getting rid of them and using valet trash service instead. You can also prevent pest control problems by becoming an issue out near your dumpsters. Additionally, you can reclaim space in your parking lot and improve the overall appearance of it by getting rid of dumpsters. You’ll be able to take pride in the way that your parking lot looks again when the dumpsters have been removed. As we mentioned earlier, property managers should be focused on one thing and one thing only when managing properties for landlords: Making money. You should, of course, also make sure you’re keeping the landlord’s tenants happy. But at the end of the day, your goal is really to spend your days doing whatever it takes to generate the most income. Using a valet trash service will cost you some money. But you’ll make most of that money right back when you’re able to charge higher rents to your tenants. You’ll also save money when you have your old dumpsters taken away. They’re likely costing you too much money right now and not offering the same kind of convenience that you’ll get when you enroll in a valet trash collection service. Property managers have a tough job. They have to worry about so many things on a day in and day out basis. You can eliminate at least one of your worries by signing up for valet trash service and allowing your tenants to take advantage of it. You won’t have to spend any time thinking about overflowing dumpsters or trash bags strewn all over the place when you have a valet service on your side. Are you a property manager looking to invest in some real estate of your own so that you can rent it out and make even more money for yourself? Take a look at our blog to learn how to do it.